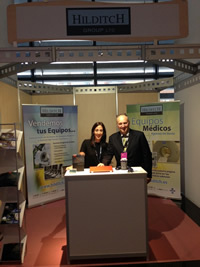 Amelia Mainer Martos and Hubertus von Wietersheim greatly enjoyed meeting new contacts and old friends while exhibiting at ‘Asociación Española de Ingeniería Hospitalaria (AEIH)’ again this week. This show, the 34th Annual Congress of Medical Engineering, is the largest exhibition for all professionals within the medical engineering industry in Spain. The exhibition took place over 3 days from Wednesday 19th October to Friday 21st October at the ADDA Conference Centre in Alicante.